Featured in Two Bare Feet’s touring category, our 12’0” paddleboards are designed to perform well when paddling over long distances. 12’0” is considered a standard length for a touring style paddleboard. It creates an elongated board shape which affords straighter tracking and higher speeds in comparison to an Allround SUP (stand-up paddleboard). Offering slightly greater speed and buoyancy than our 11’6” Entradia model , combined with slightly improved handling over the 12’6” touring iSUPs, our 12’ boards deliver superb performance. A 12’ board should achieve a well-balanced compromise between speed, manoeuvrability, stability and straighter tracking when used on longer outings. All our 12’ paddleboards have a 6” thickness which is typical for touring purposes. This allows for increased buoyancy. On top of that, the 6’ thick design sustains a greater weight capacity – perfect for carrying extra cargo on a longer journey. With an increased volume, the board will sit higher in the water. This promotes speed, especially on a long-distance journey. Our boards are also inflatable to an air pressure rating of 22.5psi – the highest used in the iSUP manufacturing industry – in order to ensure you receive the stiffest inflatable SUP available. Offering good straight-line speed combined with smooth gliding, the Phatpad is the ultimate touring board for adult riders. These high-performance inflatable paddleboards possess an extra-large bungee storage system so that you can load up with all the necessary equipment for your trip. The Phatpad Touring iSUP exudes high quality with a full-coverage, heat-moulded EVA deck grip. Not only does this improve the comfort and grip on deck; it also adds additional protection from possible punctures. In addition to this, the board has a strong DWF (Double Wall Fusion) PVC exterior. As laminate layers are heat fused together, the overall construction is lightweight. The laminated layers are also not prone to separation. Overall, the Phatpad Touring iSUP is stable, buoyant and quick. It can be used as an everyday inflatable paddleboard for a larger rider. However, we would also recommend looking at our extensive range of all-round XL SUP paddleboards if you fit this category. Our first-rate Phatpad Double Chamber Touring iSUP shares the same optimal design as our Phatpad Touring board. The main difference lies in the double air chamber construction which is designed to minimise air displacement within the board when carrying a rider. This raises its rigidity by up to 30%, resulting in a more even ride. 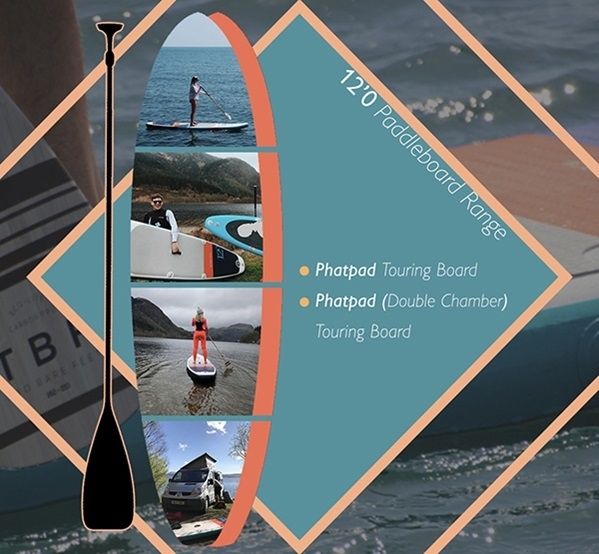 The Phatpad Double Chamber paddleboard is a premium option that gives the smoothest and most stable riding experience. All iSUPs sold by Two Bare Feet are available in a range of colours, giving you the chance to choose a board which matches your personality and tastes.